Cell-phone data could be used for development, transportation planning, and public health. Around the world, some mobile carriers have been releasing anonymized records of cell-phone data to researchers. This animation shows the movements of soccer fans before—with red indicating a higher density of fans—during, and after a match of the Boca Juniors, a leading Argentine team, at La Bombonera stadium in Buenos Aires. Researchers at Grandata, a Buenos Aires-based data analytics startup, earlier established which phones were those of die-hard fans by examining data from previous Boca Juniors matches. Then they could track 1,002 of these phones as the owners converged at La Bombonera stadium, enjoyed the game, dispersed afterward “for a pizza and a beer” in the city center, and finally made their way home, says Carlos Sarraute, director of R&D at the company. Such a map could be used for crowd and traffic control, while the insight into who are the rabid soccer fans could be gold in the hands of marketers. 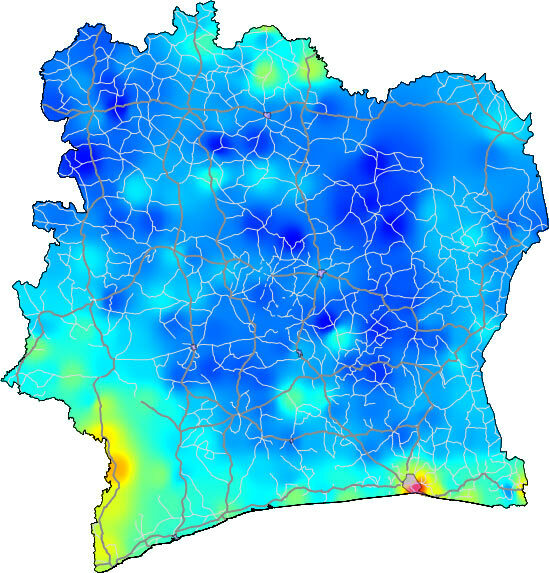 Researchers at the Catholic University of Louvain, Belgium, used records of airtime purchases to build this map of wealth and poverty in Ivory Coast. Poorer people tend to buy airtime credits in small increments. Here, bluer areas represent areas where people made the smallest average purchase increments (53 cents) while redder areas denote where people made the largest average purchase increments ($1.44). The big red spot at bottom right is Abidjan, the nation’s largest city. Such insights could help guide aid distribution, or guide product-marketing that is based on estimated household income. This map of eastern Massachusetts shows overall human density over the course of an average weekday, inferred from cell-phone call and movement data of 200,000 people provided by two undisclosed mobile carriers. It shows that in the mornings, people are concentrated in a few regional centers, and then spread out from 4 p.m. to 7 p.m. Because the underlying data is able to show concentrations of people down to a 300-meter resolution, it can be used to guide regional transportation and urban and suburban planning efforts at a finer scale, says Marta Gonzalez, an assistant professor at MIT who developed the map with a student. The data releases are not all the same, but they can include records of which phones connected to which cell phone towers, providing a trace of caller movements; with whom the connection was made, providing a map of social networks; and what purchases were made, even through simple phones, providing a glimpse of economic activity. In many cases, such data is unavailable from any other source. The results—even from limited data sets—can be dramatic. This slide show shows four examples of work going on, from tracking the movement of soccer fans in Argentina to creating detailed maps of poverty levels in Ivory Coast. They are a small sampling of the many new papers presented at a conference on the topic last week at MIT. Part of this was from a challenge called Data for Development, in which the telecom giant Orange released 2.5 billion records from five million cell-phone users in Ivory Coast. “The use of this data for development is just exploding right now, and we will only see more and more situations where individuals work with operators,” says Caroline Buckee, an epidemiologist at the Harvard School of Public Health who is working on malaria models. Indeed, some of the most promising applications for such efforts involve merging mobility data with other data sets, such as disease incidence and transportation routes. The results show how mobility patterns may influence, for example, the spread of malaria (see “Big Data from Cheap Phones”) and provide insights into how to optimize a bus system in a developing-world city (see “African Bus Routes Redrawn Using Cell Phone Data”).